BRIAN WILLIAMS, anchor: All those extra fees the airlines have been charging for things that used to be free for just about everything, turns out they've been pure profit for a lot of the airlines. The government said today that major airlines have raked in $2.5 billion on baggage fees alone, 2 1/2 billion. That's just through the end of the month of September. It's up 22 1/2 percent over last year. For example, when US Airways added up all the fees it collects, from baggage to ticket charges and stuff they sell on board the aircraft, they netted $500 million, which is almost exactly what their expected profit will be for the year. 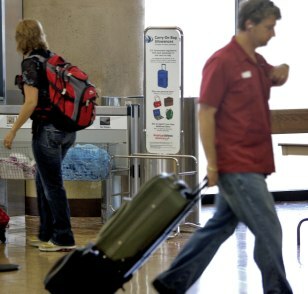 Passengers move around Sky Harbor International Airport with a display showing the allowable dimensions of carry-on bags in the background.